New York Red Bulls II came from behind to hold Nashville SC to a 1:1 draw at MSU Soccer Park. 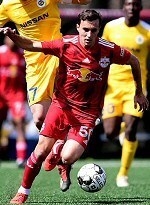 Just over twenty minutes in, Nashville's Daniel Rios was first off the mark when he pounced on a defensive mistake by Red Bulls II and rounded New York goalkeeper Evan Louro to produce a calm finish with his left foot. New York didn't make Nashville SC goalkeeper Connor Sparrow's life easy and found their way back in the game in the 55th minute. Recovering the ball in the attacking third, New York's Marcus Epps did well to take the ball to the byline before lining up a cross for Brian White to head home at the back post. New York nearly claimed all three points with six minutes to go following a well-worked set-piece routine that saw Edgardo Rito pick out Tom Barlow at the near post only for Barlow's toe-poke to ricochet off the inside of the post and back into play. That would prove the last big chance as the sides finished even for a third consecutive meeting.